Stabilization of an intracapsular fracture of the femoral neck or an extracapsular fracture of the intertrochanteric region. The procedure is indicated for the patient when early postoperative mobilization may not be feasible. The procedure could be performed under local anesthesia if necessary because of poor physiologic status. 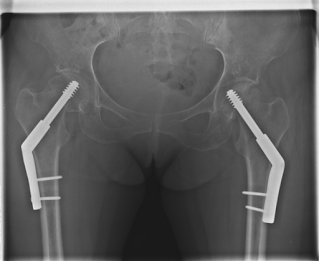 Fixation can be achieved with a variety of fixation devices, including nails, pins, or compression screws across the fracture site, or sometimes in conjunction with a plate along the femoral shaft. Supine, either on a fracture table or regular operating table that can accommodate fluoroscopy. After the patient is asleep, the fracture is reduced and checked by x-ray film. The incision is made, exposing the fracture site, and the appropriate fixation device is placed after guide wires are inserted temporarily to check alignment. A drill is used to assist a placement or fixation device, and an x-ray film is taken to reaffirm placement. The wound is irrigated with antibiotic solution and closed. Have x-ray capabilities in the room. Notify x-ray department when patient is being positioned on the table. Observe radiologic precautions. The extremity may be supported postoperatively in a cast, depending on the location/ severity of the fracture.